Yes, they did it: over the edge and down the ravine, into the “partial government shutdown.“ If you need help from your local Social Security or Veterans Administration office, forget it. Calling Fannie Mae for a loan modification? Don’t bother – those notoriously cynical bureaucrats aren’t even there. Camping in a national park? Pack up and get out. Even if you want to stage an antiwar protest at your downtown Federal Building, you may as well move it elsewhere. For the most part, the short-term effects of a shutdown are inconvenient and somewhat harmful, but not visibly catastrophic. So how deep and long-lasting is this impasse — and the bigger one looming over the debt ceiling – going to be? It’s not clear, but there are three essential points to keep in mind. First, what’s at stake: it’s not about technical details in the Affordable Care Act (e.g. the medical devices tax) or a “one-year delay” in implementing the individual mandate. It’s not about budget details, which are negotiable, but about issues of power, which aren’t. Defunding “Obamacare” or delaying it a year (a delay which could obviously be repeated over and over) would cripple the Obama presidency beyond hope of repair. That’s precisely why the racist-fuelled Tea Party is forcing the issue, and why the Democrats cannot give in even if they’re ready to viciously slash Social Security and Medicare for decades to come. 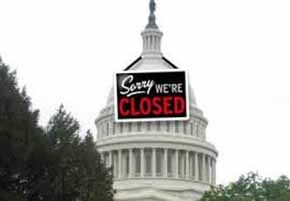 Second, how to resolve it: in these circumstances, there appears to be no way out until the shutdown lasts long enough to begin doing visible economic damage. A government cannot function if a minority faction of one party permanently “blocks supply,” i.e. chokes off essential funding. At some point, the Tea Party stranglehold over the Republican Party – which represents, in the final analysis, the control of a handful of far-right billionaires over the politics of the U.S. capitalist class as a whole – needs to be broken, although this seems unlikely to occur immediately. Ultimately, U.S. and global capital do not want to risk the consequences of a thoroughly crippled presidency in a delicate world financial climate. Wall Street might ultimately send a signal to John Boehner that he needs to get a Continuing Resolution without poisonous anti-”Obamacare” clauses up for a vote in the House of Representatives, with Democrats perhaps agreeing not to vote against Boehner if his Speaker’s position is challenged by the Teapublicans. Such an arrangement would be a highly unorthodox case of “centrist extremism,” but could become a ruling class necessity – and the threat of a split in the Republican Party might cause part of the Tea Party to tactically retreat. Third, what comes next: it’s possible that the budget showdown and government shutdown might vent the steam from a potentially more dangerous “debt ceiling” crisis that hits around October 15. The Tea Party’s rage over “Obamacare” could slowly burn itself out in the shutdown, allowing the debt ceiling increase (which is the creation of a 1917 law enacted for the funding of World War I) to occur without too much fuss. But that’s not the current trajectory. Instead, the fights over the budget and debt ceiling appear to be combining to create a real tidal wave – and here lies the possibility of a genuine Constitutional crisis resulting from bourgeois political gridlock. The fact is that a partial government shutdown can last for weeks, or even months, without truly devastating consequences. A U.S. default, even a technical one where no actual bills are unpaid, can’t. Not only the U.S. financial system but the world economy rests in large part on the safety of investments in U.S. debt. If the Republican Party imposes the kind of unacceptable conditions on raising the debt ceiling that it has declared on the budget Continuing Resolution – essentially demanding that the Obama presidency commit suicide – pressures will build on the president to take unilateral action to raise the debt ceiling on his own, relying on ambiguous Constitutional clauses declaring the president to be responsible for maintaining “the full faith and credit” of the United States. Conceivably, Obama could declare a provisional lifting of the debt ceiling in lieu of Congressional action. Would that be illegal – really? More illegal than indefinite detention without trial at Guantanamo? More illegal than “extraordinary rendition” and torture in the War on Terror? This scenario would put the U.S. political system in uncharted waters. The shame of it all is that the U.S. working class is essentially a passive spectator, even as people’s real lives are damaged – when what’s really necessary is mass action to shut down corporate capital. ORIGINAL ARTICLE: Is the Ship of State Heading for Shutdown? Is the U.S. government really shutting down on 10/1, or going into debt default around 10/15? Can this actually happen just because the Tea Party demands defunding Obamacare? Doesn’t the ruling class have some skin in the game of preventing a potential financial panic and market meltdown? Those are some of the questions swirling around the mainstream and even left media this week. As theater it has its slightly comical side, but there are serious issues on the line for both “the 99%” and “the one percent.” The pure savagery of the Republican assault on the food stamp program, the escalating social damage of the “sequester” cuts, the right wing’s intent to wipe out Social Security and Medicare (which “centrist” Democrats only want to “trim”), all threaten the lives of the working class majority. The Tea Party was largely created by a section of the ruling elite–the billionaire Koch brothers and the like–for this purpose, exploiting the paranoia and racism among white Americans as leverage against the Obama presidency. This serves the interests of a capitalist class that profits from imposing austerity, but the peculiarities of the U.S. political system have enabled the rulers’ creature to become a monster threatening the political structure itself. The House of Representatives has become a rigged game in the wake of blatant gerrymandering by rightwing state legislatures. There were 1.4 million more Democratic than Republican votes in the 2012 Congressional election, but Republican control of the House remained secure, and will almost surely remain so in 2014. The Republican Party itself is held captive by its Tea Party wing, which has promised its voting base the repeal of “Obamacare” (the Affordable Care Act). The capitalist class itself, including the insurance industry, is not threatened by Obamacare, let alone to the point of shutting down government over it. But the Republican leadership is trapped–willingly or not–by its self-declared doctrine that no “continuing resolution” (a short-term substitute for a budget) can be allowed to depend on Democratic votes, and no resolution that preserves Obamacare will carry a majority of Republicans. In a parliamentary system, gridlock is resolved by dissolving parliament and calling an election. But in the U.S. system, legislation generally depends on deals–often rotten ones–between sectoral fractions mediated by party leaderships. With the Tea Party blocking such dealings over Obamacare or the debt ceiling, the Republican leadership has a choice between taking responsibility for paralysis, or risking an all-out struggle with their own right wing. The makings of a very vicious bipartisan budget deal are actually in place, as explained in detail by the astute leftwing labor economist Jack Rasmus (in “Austerity American Style”). It would permanently cut corporate tax rates and seriously damage the so-called “entitlement” on which working class Americans depend in an era of desperate job and income insecurity. At this juncture, however, the consummation of the deal is blocked by the right wing’s ideological commitment to destroy Obamacare and the Obama presidency, even if most of corporate capital doesn’t even much care about the tepid health care reform and certainly has no big quarrel with this president. 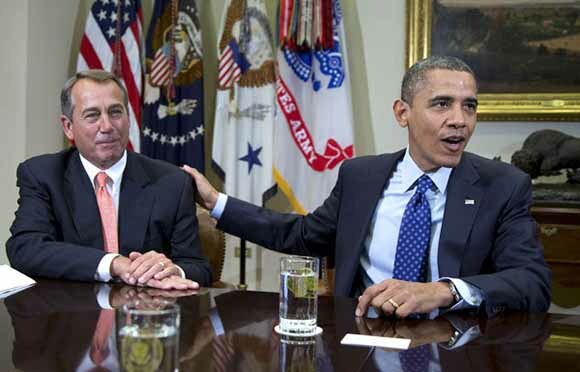 Obama and Boehner in a meeting about the gridlock. Photo by Carolyn Kaster, AP. The stakes go beyond the funding of Obamacare. For the far right in Congress and their Koch-funded think tanks (if the word ‘think’ can be abused in this fashion) like “Americans for Prosperity,” “Americans for Limited Government” and so forth, forcing legislative paralysis and government shutdown appears as the golden opportunity to end, once and for all, any prospects of government action to ameliorate the social crisis through intervention in the workings of the sacred “free market.” It would mean open season not only on “entitlements” but on the remaining shreds of legal protection for labor. The Democrats, for their part, cannot afford to accept the crippling of the Affordable Care Act for the simple reason that it would effectively mean the end of the Obama presidency and, for that matter, any meaningful existence of the Democratic Party itself. The script now calls for the Democratic-majority Senate to pass the “continuing resolution” stripped of the defunding of Obamacare provision, then kick it back to the House with a “dare” to reject it and leave the government without funding for basic operations. The byzantine rules of the Senate allow for a minority-of-the-minority to delay if not block even a simple vote of this kind, even to the embarrassment of the Senate Republican leadership (McConnell, McCain, Graham etc.) who are scared over the looming shutdown. 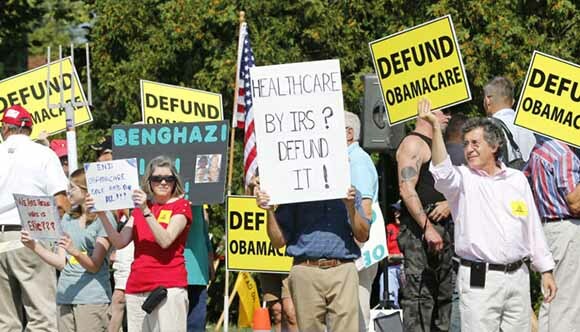 Tea Party members protest Obamacare. All kinds of blackmail and dirty tricks will go back and forth until there is, or isn’t, a last-minute resolution of the deadlock. Maybe a deal will emerge, for example, to wrangle some conservative votes for the continuing resolution in exchange for approving the Keystone XL pipeline. Republicans took a big political hit the last time they tried this stunt of forcing a government shutdown in 1995. At that time, however, there was less threat of lasting damage to an economy in a period of upturn. The dangers are much greater today, in a weak global economy and a fragile U.S. recovery that remains dependent on ultra-low interest rates and Federal Reserve “quantitative easing” purchases of government debt. A 500-point or more slide in the stock market would capture the attention of bourgeois politicians. But equally devastating, fundamental problems are getting less and less attention as the shutdown prospect looms. There is zero possibility, for the remainder of the Obama presidency, of a federal living wage, of any meaningful action on climate change, restoration of the crippled Voting Rights Act, a serious jobs-creating stimulus program, relief for crushing student debt, or a moratorium on home foreclosures – or anything else to deal with the brutal social consequences of capitalist crisis. To achieve any of those things will require social upheaval from below–on the combined scale of the recent Occupy upsurge, the historic Civil Rights Movement, and the mass strikes of militant labor of the 1930s and ‘40s. The survival of the 99% requires nothing less.